Healthy competition is good! On January 29, the Belgian Digital Scene moved their daily battle to the bowling alley. Every Belgian digital player was invited to the event that combined team building and networking with a healthy dose of playful competition. More than a hundred participants from 31 different Belgian digital companies came together in the bowling palace in Lochristi (East Flanders) to compete for the position of the best player in the industry. The first edition of the Battle of the Belgian Digital Scene organized by Bloovi proved to be an instant hit. The Battle of the Belgian Digital scene showed that the combination between sports league, team building and networking makes for a great evening. Worthy to the sector the battle began digitally. The teams challenged their opponents via twitter letting each other know that they participated in order to "throw the other out". The teams were "in it to win it". The healthy competitive commitment and desire to win made the evening into a great party. The stakes for the event were literally high. Teamleader offered a bottle of cava for the first 75 strikes and brought the players into higher spheres. 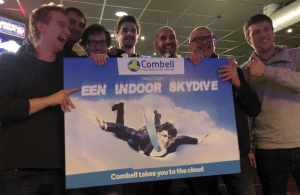 Combell launched the winners of the evening into the clouds with an indoor skydive for four people as first prize. Thanks to the main event partners the best digital players could experience the cloud literally for a change. Combell was represented by Frederiek Dobbels, Stijn De Freyne, Simon Verdonck and Bram Hornsby who brought us to the finals and proudly placed seventh. Puresigns team took the first prize. Hopefully they’ll keep their feet on the ground despite the eternal fame and glory of the sector and their launch into the cloud! Of course participation was as important as victory. With this video you can experience the great spirit of the event. And you’ll see: the Belgian Digital Scene is in top shape! Attention: your footer has become important!